There are all kinds of retrospectives and reflections happening in the blogosphere right now. My look back will not be nearly as emotional or deep as some of the ones going around. 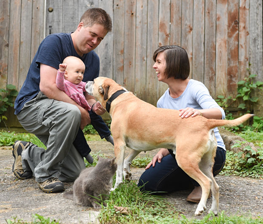 I feel like 2015 was a pretty good year for this blog and our projects at the farm. Last January, I said I wanted to be flexible and not knock myself out renovating all the time. I definitely feel like I managed that. I also had a few more personal posts mixed in over the course of the year, and I’ve made some progress on that front too. For now, it’s time for the annual report on how we did on Home Goals 2015. 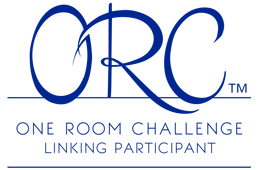 Thanks to the One Room Challenge, we have a beautiful master bedroom. I love having another room completely done. 2. Basement art No check. The smallest task on the list–and the one I was most enthused about at the start of last year–was the one where I made no progress. This one will carry over to 2016. 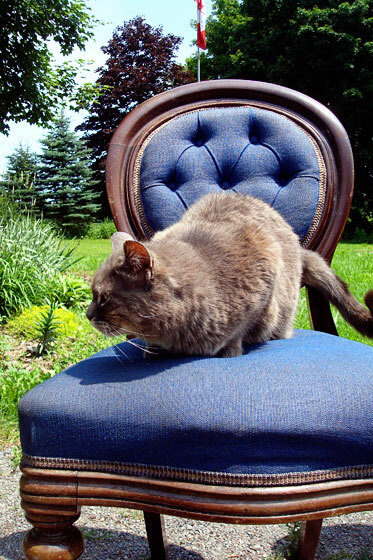 Looking back over the year, I was a bit surprised at how much furniture we bought, made or made-over. We did better than I thought. However, there’s always more on the list, hence the partial check. Found 2 bookcases that I’m going to make into a china cabinet for the dining room. They still need their makeover, but they’re working okay for now. 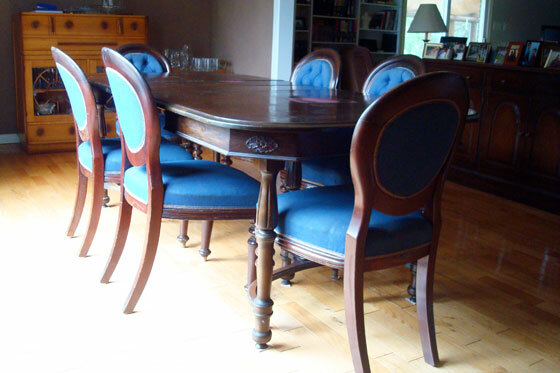 Found a set of 8 dining room chairs that match our table nearly perfectly. 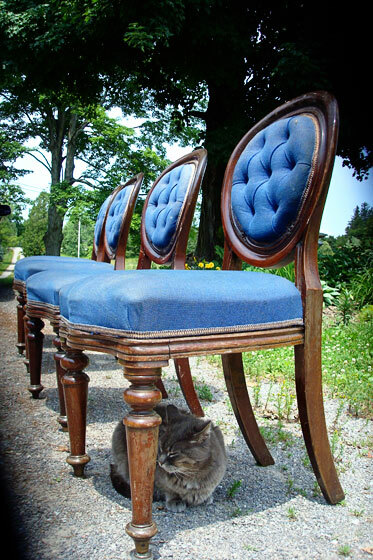 They’ll need to be reupholstered and refinished someday, but once again, they’ll do for now. Found a ladder/step-stool/chair that reminded me of my grandmother–and a lot of you of yours. Made a headboard and painted a dresser as part of the master bedroom makeover. 4. Vegetable garden Big fat check. My one and only outdoor goal for the year was a huge success. It started when I decided to build the garden in Matt’s “goat ring.” To get rid of the weeds, our nephew and I lit it on fire, I spread out the world’s biggest tarp, and then Matt rototilled the whole thing. 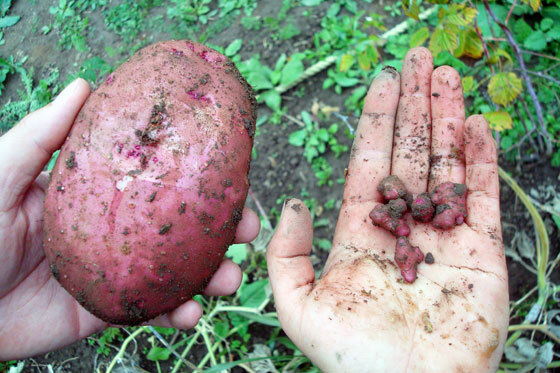 We planted and watered and then we harvested… and harvested… and harvested. Along the way, I built a gate, and Matt and I put up chainlink all the way around. And then at the end of the season, I spread manure over the whole thing. There’s still more work to be done. It’s a garden, which I’ve learned is synonymous with work. However, it’s established. It produced food. We’re still eating our harvest. And I’m so enthused about this year’s plans. But that’s the stuff of home goals 2016. Those will be coming up next week. How did you do on your goals in 2015? What was your big accomplishment? 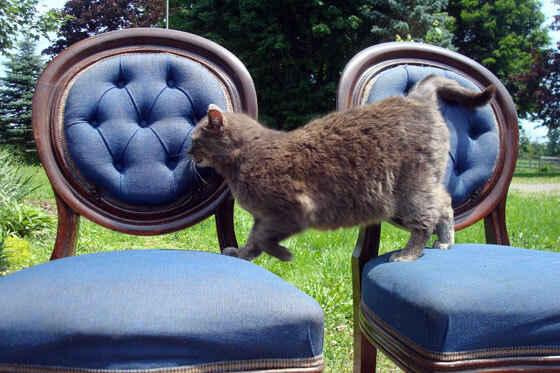 Somehow, I’ve ended up married to a person who cannot–cannot–pass by a Value Village without stopping in. Now I enjoy thrifting as well. However, more often than not, I end up walking around the VV parking lot with Baxter, as I prefer not to leave him in the car. So a few weeks ago, Bax and I did our shopping in the parking lot. I’ve been on the hunt for a china cabinet to use for storage in my office. There just happened to be a pair of bookcases sitting outside the VV that I thought might work. A quick conversation with the clerk confirmed that they weren’t sold, and he was more than happy to be spared carrying them into the store. When we got them home, it turned out they were a bit too big for my office. 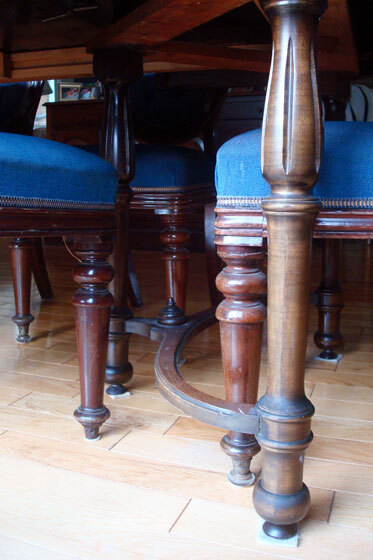 However, I thought they might work for the dining room. I’ve been on the hunt for a new china cabinet for the dining room for a little while. In fact, it was one of the items on my Home Goals 2015 list. I had visions of using a big 1990s style entertainment unit for the dining room. I was blown away when I first saw Thalita’s entertainment unit makeover in her kitchen, and it sparked all kinds of ideas. An entertainment unit–one that used to hold those huge boxy TVs–would give me a tonne of storage. And even though these are more bookcases than TV cabinets, they totally do. The cupboards below hold our wedding china, wine glasses and other serving pieces and keep them sheltered from dust–even with a lovely cutout in the back of the cabinet. The shallow drawers are perfect for candles and cutlery. The shelves above hold the prized Bleu de Roi china that I inherited from my grandmother and some bar supplies along with Matt’s collection of steins and shot glasses. I haven’t done much styling for these shelves. I’ve more just unloaded various cupboards. And this set up is definitely not final. My original vision was for three bookcases. I still have plans to build a middle section to tie the shelves all together. Plus remove the arch at the top of the cases, update the trim and the hardware, add glass doors to the upper section (I don’t believe in dusting, so open shelves and I do not get along) and then paint everything. Plus someday I’d like to paint the walls in the dining room, relocate the antlers, etc. etc. etc. For now though, I figure I’m at least 2/3 of the way there. In case you haven’t heard, a vegetable garden was my biggest home goal for this year. Well, I am officially declaring the garden a success. We did our last harvest a week or so ago. And just in time too. Frost is a regular occurrence now, and the plants have all shriveled up. They’re not producing any more produce. But they were pretty productive for most of the season. I knew the squash was going to be plentiful. When it was time to pick, I didn’t even consider a basket. I got out the wheelbarrow. This is the first load. Please note that there are still numerous pumpkins hanging on the fence, just waiting to be picked. 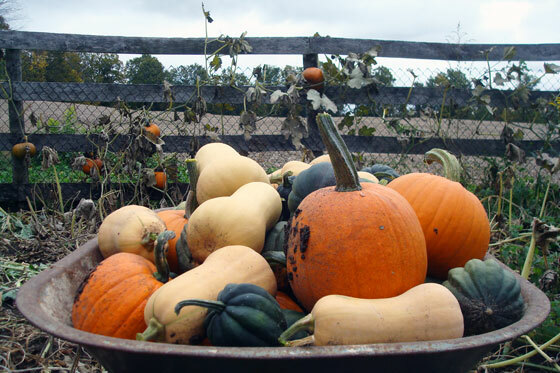 The grand tally is 37 pumpkins, 39 butternuts and about 70 acorns. We donated several of them to Thanksgiving dinners on both side of our family, and then brought them as party favours for all of the guests. We’re also eating them ourselves, of course. This is the corner of my dining room where they are currently living. Lovely dinner party decor, aren’t they? Apparently, there was a reason I didn’t toss the cartons that held the fireplace stone. The cartons also came in handy for the rutabagas. Matt was joking when he suggested we plant rutabagas. Neither of us knew what they were. I don’t think I’ve ever eaten one. I know I’ve never cooked with one. Seeing a carton full of these large vegetables was a bit daunting. We strategically picked the rutabagas the week before Thanksgiving. Then we divvied them up, and Matt and I took two-thirds of them to work. 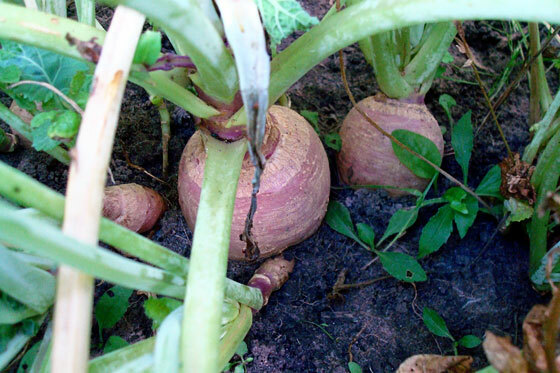 Thankfully, many of our coworkers were enthused by the idea of adding rutabagas to their Thanksgiving menus, and we were able to get rid of most of them. I did cook one for our own Thanksgiving dinner. 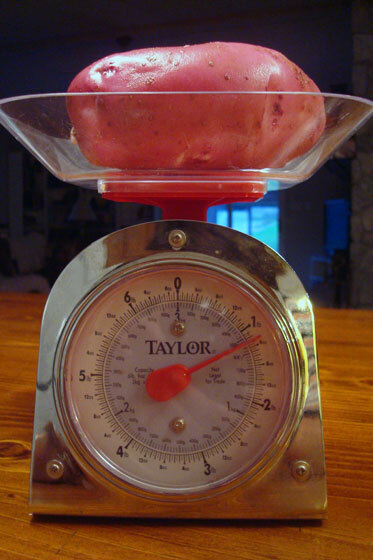 The recipe called for one large rutabaga “about 1 1/2 pounds.” My version of a large rutabaga weighed in at 3 pounds–double the recipe. Thankfully, we liked the rutabaga, so we didn’t mind that we had a lot of it. The other star of our harvest were Matt’s potatoes. 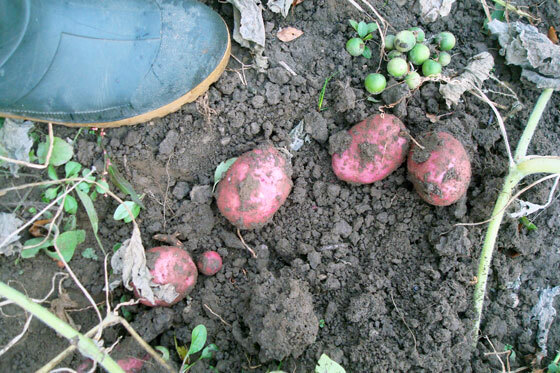 We had just three plants, but they produced some beautiful taters. There were some big ones, some medium ones, and some wee-tiny potato-lets. That big guy came in at more than a pound all on his own. 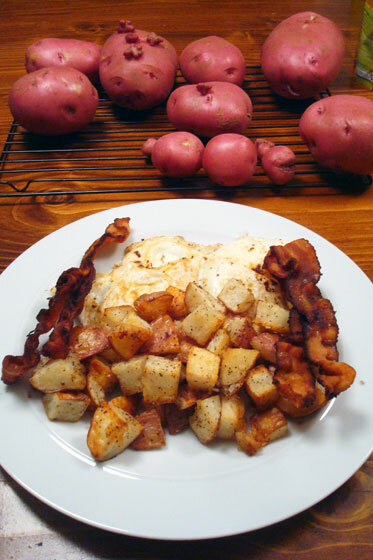 In total, we had 6 pounds 4 ounces of potatoes. And they taste amazing. I definitely notice a difference between our fresh homegrown ones and the grocery store. (This may be cruelty to vegetables). 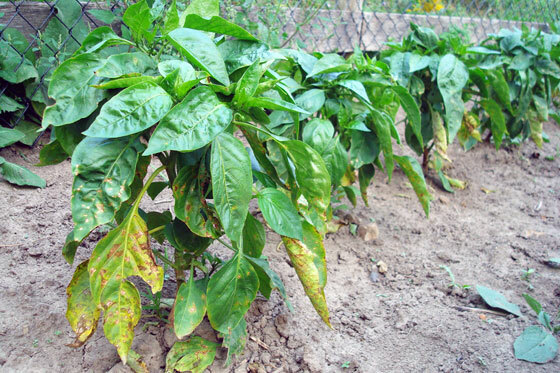 The only things that did not do well–and I’ve talked about this before–are our poor peppers. We had 8 red pepper plants and 12 (supposedly) jalapenos, all of which did pretty much nothing. We got probably about 6 peppers total, and they all resembled misshapen green bell peppers. The one pepper that started to turn red shriveled up and fell off. And note how the plant is blossoming again even though fall leaves are on the soil around it? These guys just could not get it together. Our final harvest included those last few peppers, a small bushel of tomatoes, half a basket of beets, and of course, more zucchini. Those things just kept coming. Not pictured are two more baskets of Matt’s onions. Oh, and we grew a puppy too! 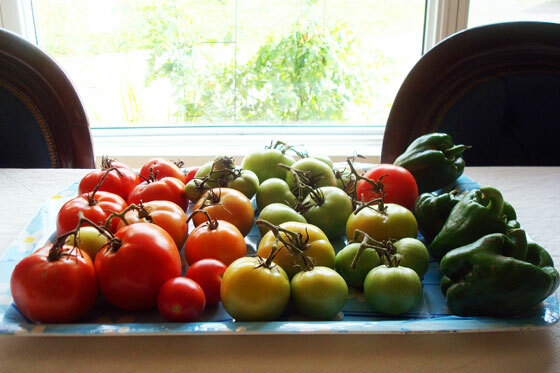 The last of the tomatoes and peppers are now on the dining room table, ripening the rest of the way in front of our best window. It’s so great to have finally fulfilled my dream of having our own garden and growing our own food. And it’s something that Matt and I both really enjoyed–I love projects that happen like that. We have more to do to wrap up the garden for the season. I’m already full of plans for next year. 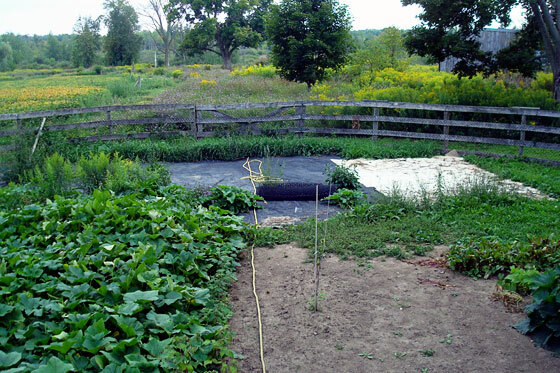 But for now, I can pretty much check vegetable garden off the 2015 wishlist. 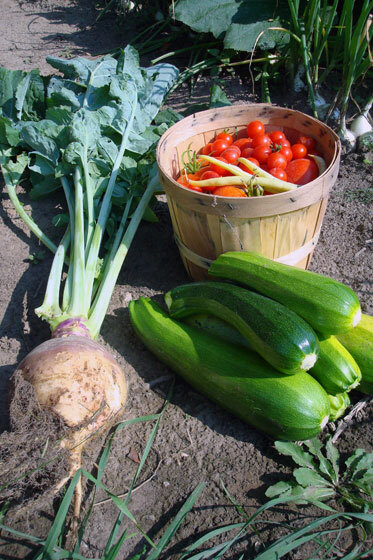 Did you have a vegetable garden this year? 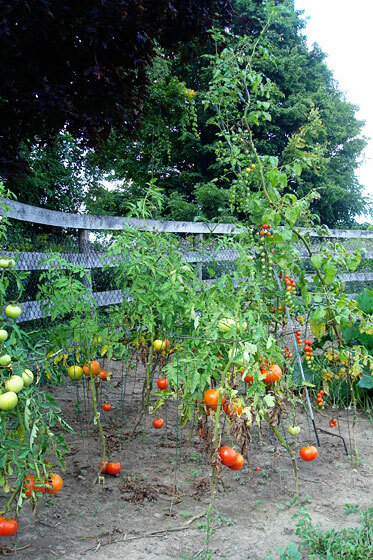 How did your garden grow? 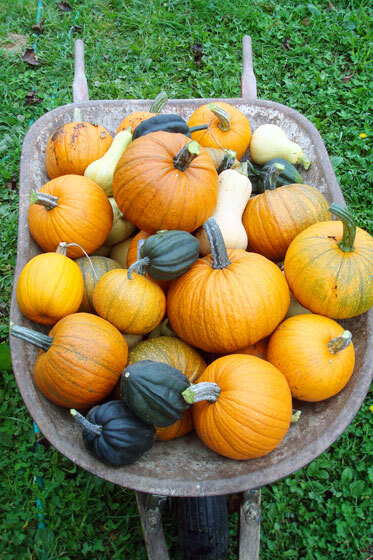 Do you have any favourite squash or pumpkin recipes to share? I can no longer deny it. Fall is here. I’ve been hanging onto summer as long as I can, but last week the temperatures DROPPED. As in, we had a windchill, and I wore my winter jacket, hat and mitts for Baxter’s and my morning walk. Every year as fall rolls in, a list starts in my head. It’s not completely a do or die list, but it’s definitely a “winter is coming and you’d better get your act together” list. So here we go: the fall to-do list. This was my biggest home goal for 2015, and before the year ends, there are a few more things I’d like to do. Hang the gate – The gate has been hanging around unhung for long enough. We need to take a bit of time, sort out the hinges and just get this done. 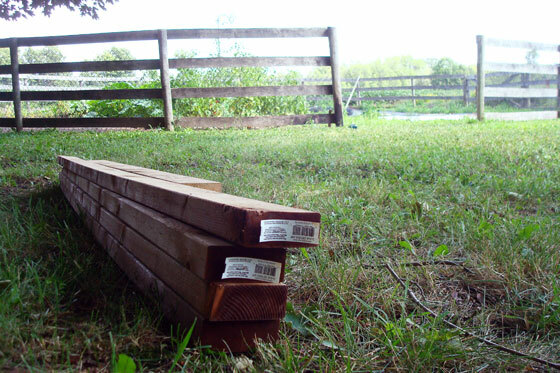 Edge the garden – We have a huge pile of old fence posts, and my plan is to use them as kind of “curbs” to help keep the weeds out of the garden. Put in raised beds – I’m going to use the rest of the fence posts to make a ring of shallow raised beds around the outside edge of the garden. 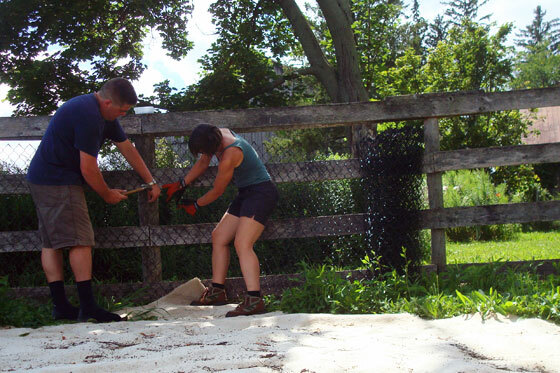 Spread manure – This is our chance to knock two tasks off our to-do list at one time: clean out the 17 stalls in the barn and fertilize the garden. The manure is well-aged since it’s been here since before we bought the farm. I love watching the birds from the dining room window, and feeder is the best way to attract them. 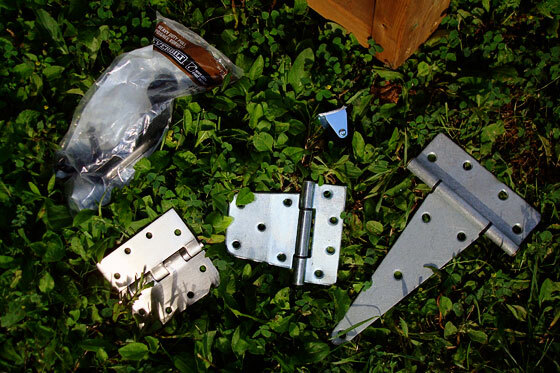 Reattach feeder bracket – Last year when we were hammering the bird feeder post into the ground, one of the brackets broke off. My cousin made the post for us originally, so I’m going to tap him to reweld the top bracket. 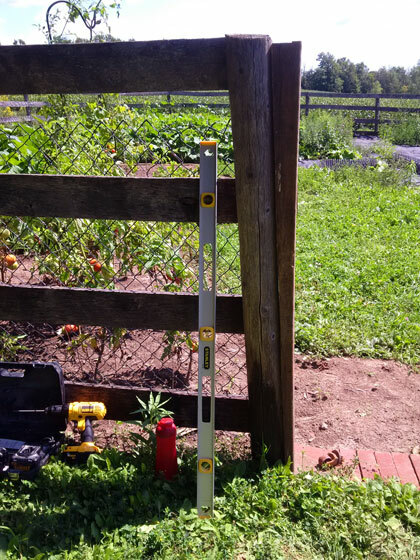 Install a sleeve for the post – To make sure we don’t have to hammer the post anymore, I’m going to put a length of pipe in the ground so that the post can just slide in every fall. This is our first fall with a fireplace, and we’re so looking forward to firing it up. Put up another row of firewood – We have two rows of wood dried, split and stacked. I think we’ll need one more row to get us through fireplace season. 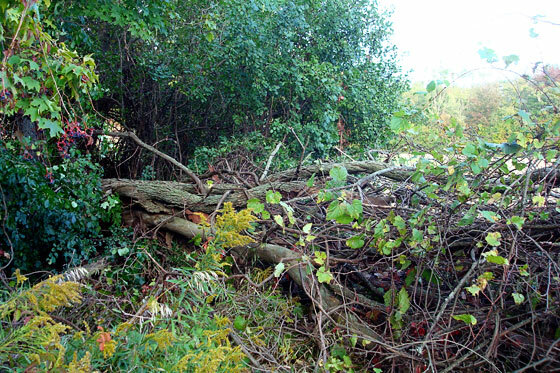 Tidy up the trees – Tree maintenance that’s an ongoing task at the farm–as demonstrated by the big tree above that came down over the weekend. Fortunately, we have a steady supply of firewood as a result. Our handy-dandy tractor needs his annual tune-up. Change the oil – More accurately, have my handy cousin change the oil for us. 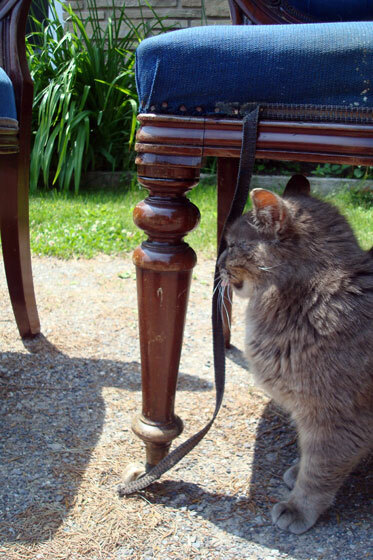 Check the battery contacts – Wiley’s a bit reluctant to start sometimes. In the spring, we had a loose connection on the battery terminal, and my cousin made us a little sleeve to tighten up the clasp. Cold weather starts are even harder for Wiley, so we want to make sure we do everything to help him out. 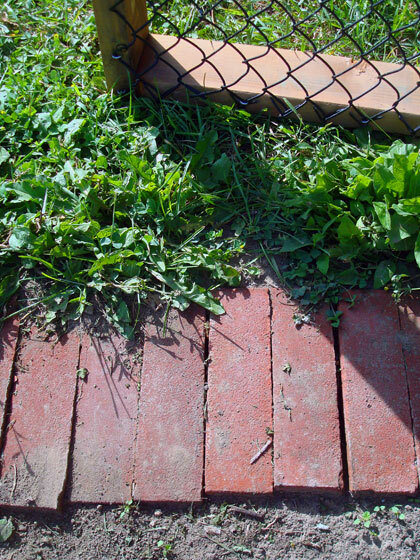 Remove the mower deck – It’s that time of year again. There are a few things to do for the place where we actually live. Take off the screens – The screens get so dusty during the summer, I’ve found it’s necessary to take them off and give them a good cleaning before it’s open window season again. 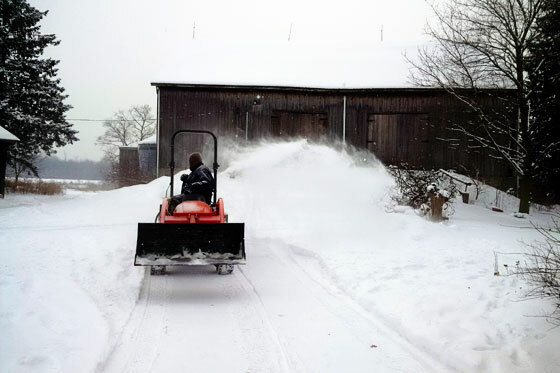 Clean the heat pump filter – I broke out the shop vac on Friday, figuring that we’d need to fire up the geothermal before the end of the weekend. Sure enough, as of last night the heat is on. 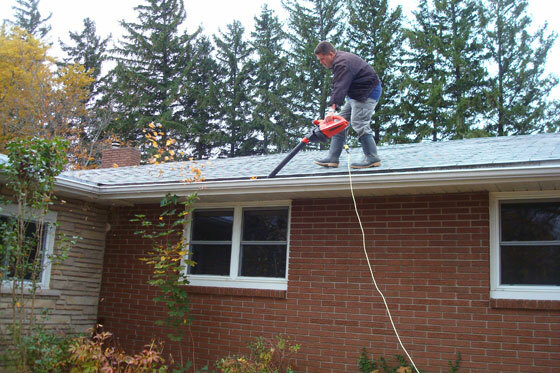 Clean out the gutters – Matt did round one last week, but we’ll need at least one more cleaning before the snow falls. I feel like I’ve been taking it easy for a little while when it comes to work around the farm. So step one to completing is to find my motivation. Any tips? Obviously, some of these tasks are unique to the farm. But some of them are universal no matter where you live. What’s on your fall to-do list? Are you feeling the pressure of impending winter? It’s been a little while since I’ve shown what’s in the garden–and it’s awesome. Our tomatoes have done super well. They just keep growing and turning red. Our cherry tomatoes in particular have grown super tall. Taller than Matt. 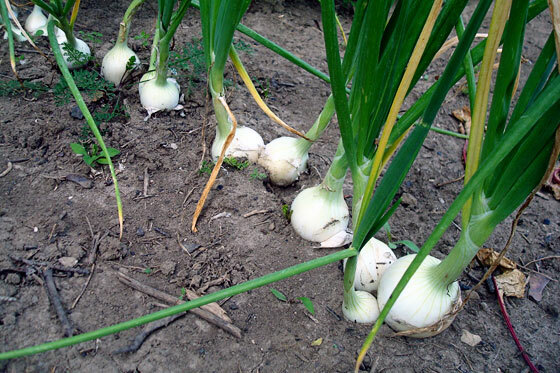 Next to the tomatoes, Matt’s onions are getting ready to take their first steps. 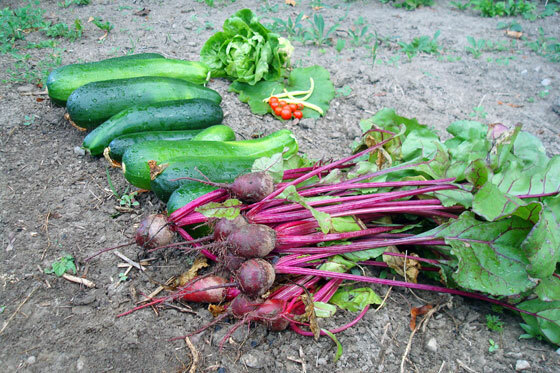 Our beets and zucchini are producing like crazy. I have to pick every day to stay on top of the zucchini. I finally tried out the grater attachment on my food processor for the first time and grated up 34 cups of zucchini. They’re tucked into the freezer. It appears that I’m going to be making zucchini something all winter long–and pretty much every day between now and then. Despite having only four plants, we’ve had a decent crop of beans. Although Matt did make fun of me one night when I steamed just 10 beans for us both. I thought they were pretty much done, especially given that I broke the main stem on our biggest plant, but new blossoms are appearing on the other plants, so I think more beans are on their way. I’m probably most excited about our raspberries. I have a full row of reds that have all successfully transplanted from my parents. 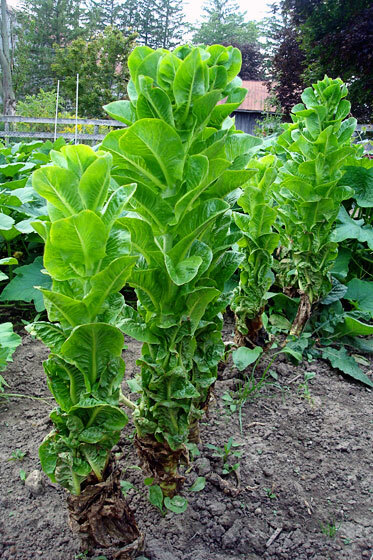 The blacks haven’t done so well, save for this one plant, which has lots of green shoots. I’m going to try to transplant a few more blacks to see if they’ll establish themselves before winter sets in. 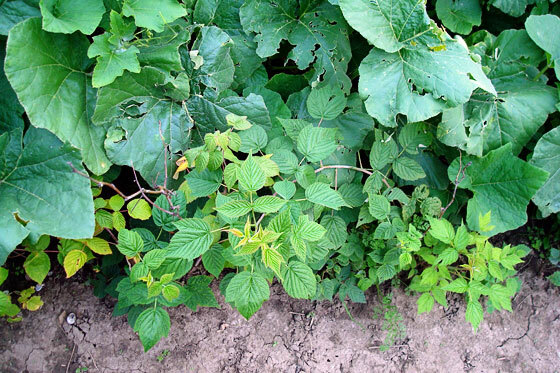 The biggest challenge is to protect the raspberries from the squash. Matt and I are both a little bit afraid of the squash. Seriously. 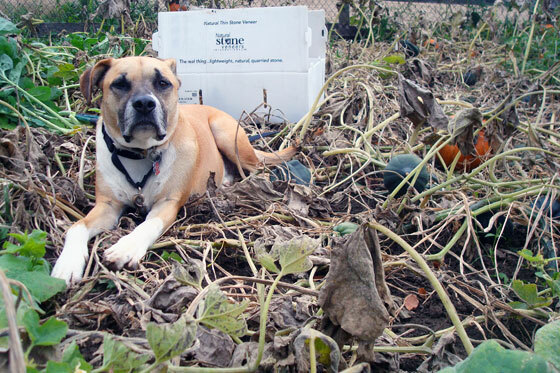 They have ambitions to take over not just the garden, but also the farm… and perhaps the world. Keep an eye out. They’re coming for you. 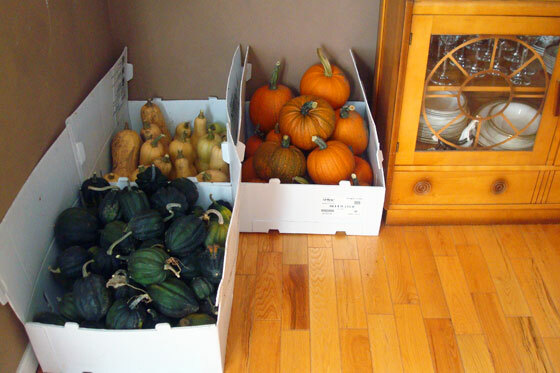 We have acorn, butternut and pie pumpkins. And we’re going to have tonnes of them. I’ve already notified Matt’s and my families to not buy any squash at any point in the future. Anyone know how to tell when squash are ready to harvest? Some of these are looking pretty close, and some of the leaves on the vines are starting to die. The east front of the squash advance is headed by the pumpkins. They’ve broken through the fence and are heading for the soybeans. Matt mows them every so often, but a few fruit have climbed the fence to get out of range. 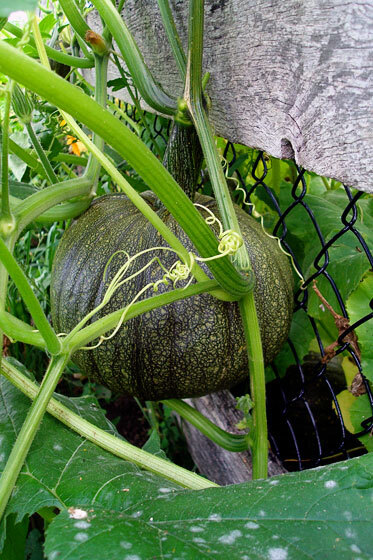 These green globes are my test case to see if the stalks are strong enough to hold the pumpkins while they mature. 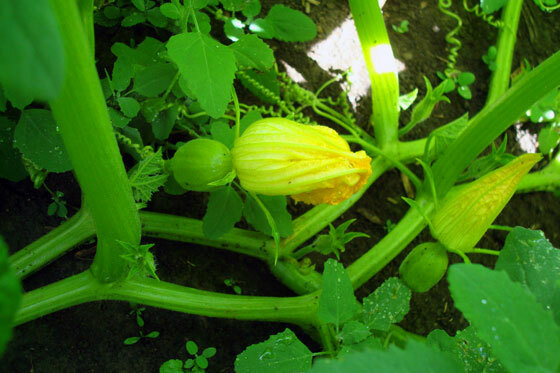 I’m adding squash trellis options to my Pinterest board as I plan for next year’s growing season. 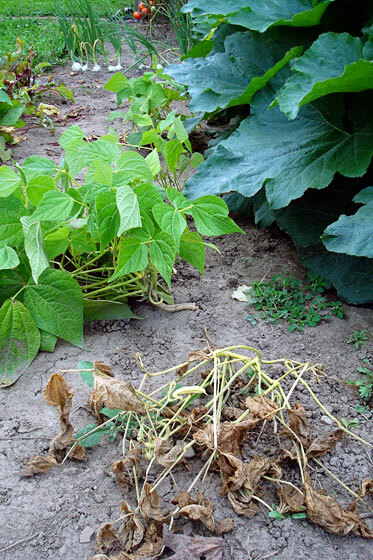 The northern advance of the squash has already consumed the rutabags and potatoes. My only hope is that both of these crops grow underground, so they might survive the surface invasion. Just to the edge of the advancing squash are our poor peppers. They’re actually looking a bit better finally. They’re growing bigger and they’re blooming again. I’m hoping that the blooms finally set into actual peppers. 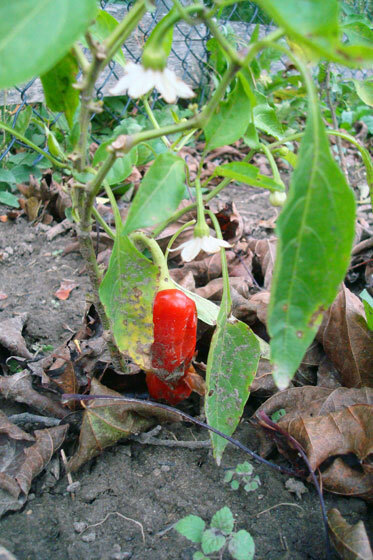 We have one lone pepper in the first bunch of plants that we planted at the opposite end of the garden. 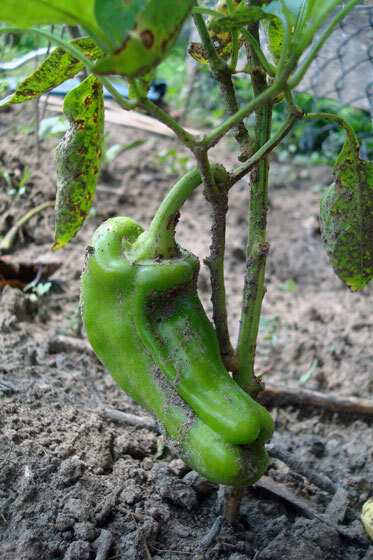 He’s a little bit warped, so maybe this is a symptom of the other problems we’ve had this year with the peppers? The lettuce have officially bolted. We’re leaving them alone as Matt wants to see how tall they’ll grow–apparently he has a thing about height. 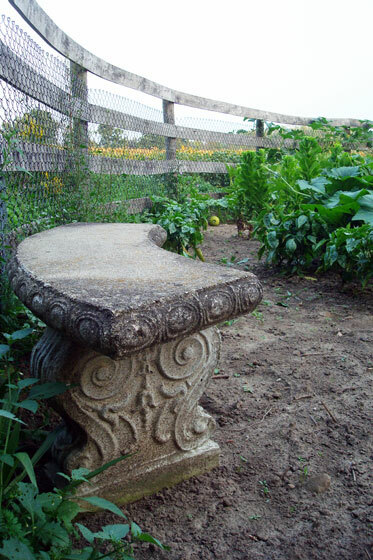 A nice touch that I’m also enjoying is the stone bench that we’ve added to the garden. 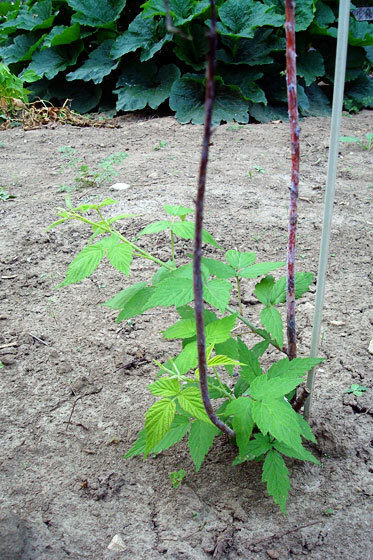 This sits at one end of the raspberry rows–the cross axis of the garden. The curve of the bench fits in well with the curved edge of the garden. I’m looking forward to sitting here and seeing the view across the garden and out over the fields. For now, the other half of the garden is still under wraps with a tarp and some old carpet. (The rope marks the centre axis, so I can keep the raspberry rows lined up). This photo is definitely about keepin’ it real for all of you fellow non-Pinterest-perfect gardeners. I’m patient enough to wait for next year to farm this other half. I’m definitely satisfied with what we’ve accomplished this year. And we’re more than satisfied with the harvest we’ve had. 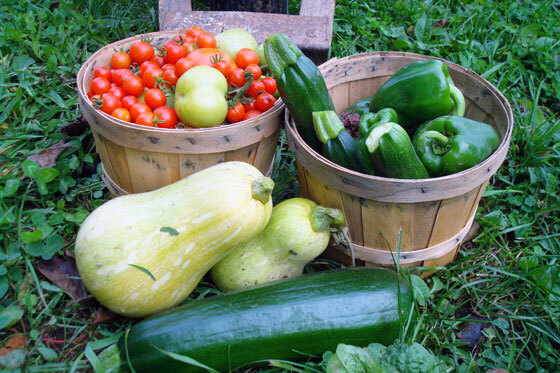 What fresh food are you enjoying this season? Have you grown anything this year? Any thoughts around what might be wrong with our peppers? 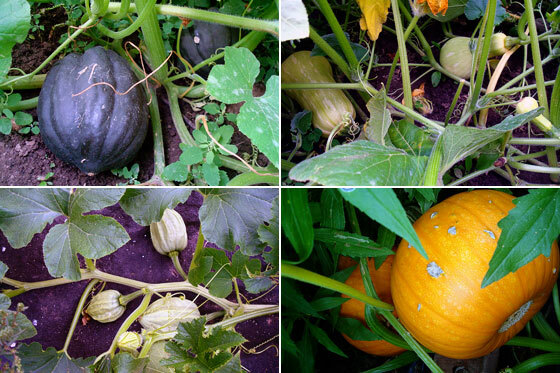 Have you had any sightings of our squash yet invading your neighbourhood? 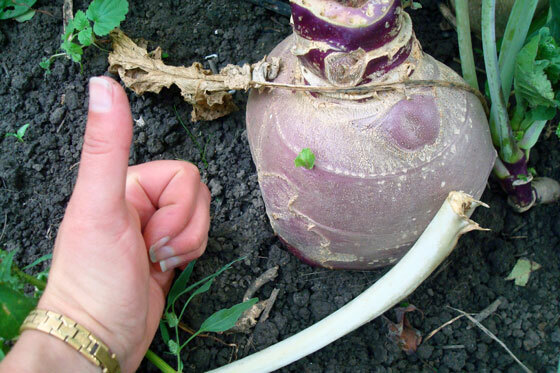 We’ve crossed an important milestone in the garden. We are now fully enclosed. I finally built the gate last weekend. 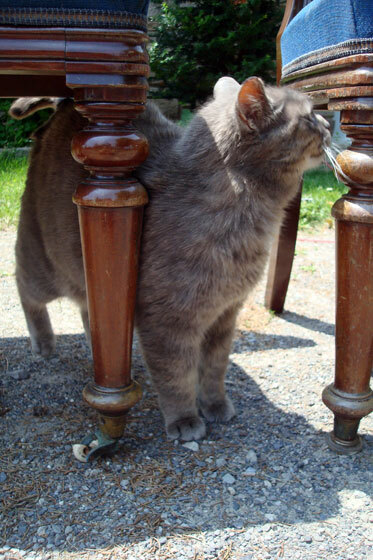 The first step, and the most time consuming part of this project, was to plumb my posts. The fence posts were anything but straight. They were meant to be fence posts, not gate posts. You might recall that this only became the gate when my nephew and I cut through the fence rails. I found two 4x4s and ripped them down for each post. They were attached to the posts with the longest screws I could find. Not too difficult. 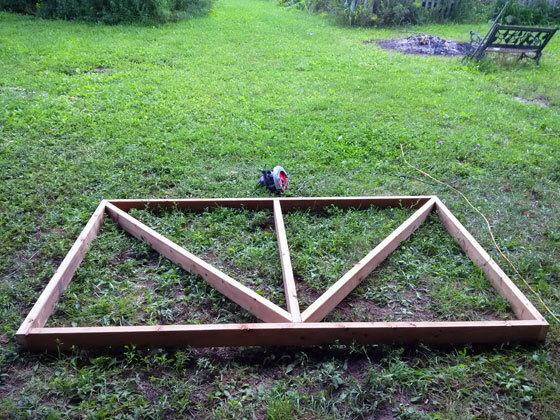 Just fiddly, but worth it so that I could build a rectangle gate rather than a trapezoid or parallelogram. So I drew up my plans and got to the easiest part of this project, the gate itself. 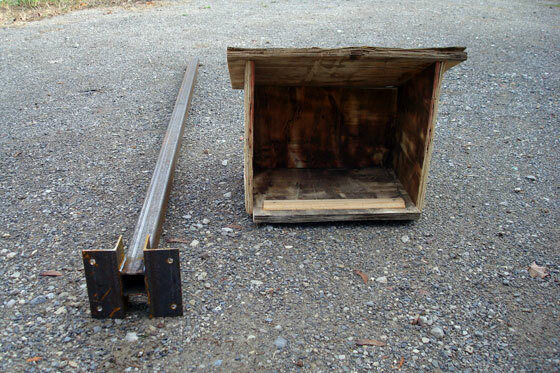 I made the outside frame, added a centre brace and tested the fit. It was too wide. I knew my tape was sagging when I measured the opening, but I thought I’d compensated enough. Ugh. Baxter was very concerned. I unscrewed one end and trimmed off an inch, and that fixed the problem. This still wasn’t a difficult project. I squared the gate and added my diagonals. 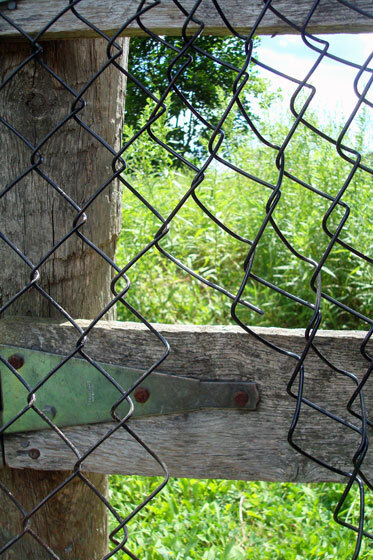 Our usual chainlink mesh adds some extra stability to keep everything tight and square. We had both 4 foot and 5 foot chainlink on hand. I picked the 5 foot because I wanted it to run all the way from top to bottom. I’ll borrow my FIL’s heavy duty wire cutters and clip off the excess height. (Allow me to brag a bit by pointing out our extremely tall tomato plant towering over the mesh). 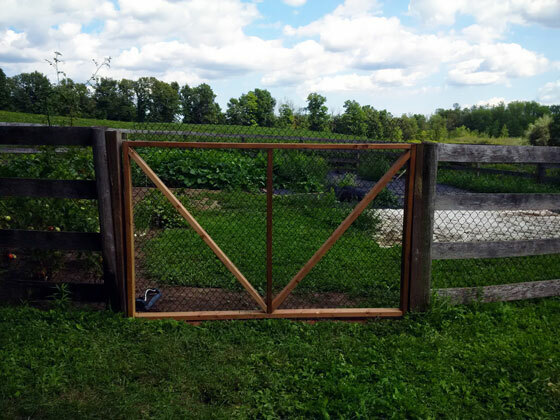 Even though these are just 2x4s, the gate is pretty heavy–a factor of being 7 feet wide and nearly 5 feet tall. I’m considering adding a little wheel on the underside so that we don’t have to muscle it all the way open and closed. I just don’t want the wheel to be too tall because I don’t want much of a gap between the gate and the brick threshold I put in. As well, if the wheel ends up tangled in the grass, it’s not going to be much help. I may end up with just a handle of some kind to make the gate easier to lift. While I’m still sorting out these details, the gate is just propped in place. The other details I’m trying to sort out are the best hinge solution. 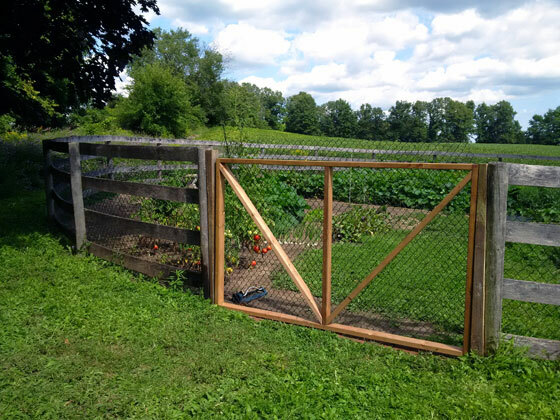 Between the narrow 2x4s of the gate, the tapered 4x4s of the posts and the excessive weight of the gate, there isn’t a clear hinge choice. I really value Home Depot’s easy return policy in this situation. I can buy pretty much every option and bring them home to see what will work best. (And I did buy a handle and small caster as well). Hinged, handled, wheeled or not, the gate is still doing its job. And the vegetable garden is continuing to take shape. What have you built this week? 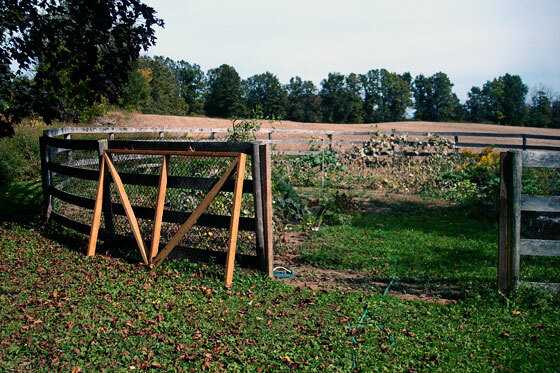 Have you ever constructed a gate? Any thoughts on whether the wheel will work? How long do you think it’ll take for the new wood to weather so that it matches our fence? 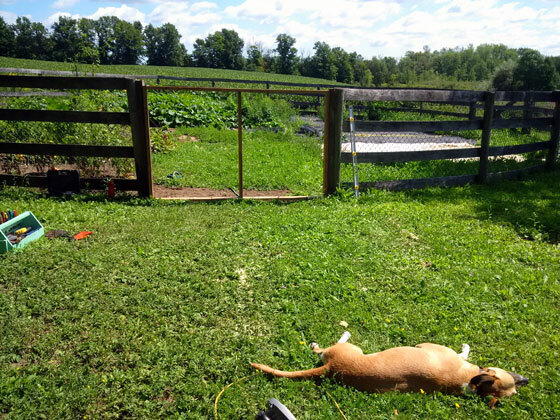 The benefit of using the old longe ring for the garden meant that we already had a fence. However, it was a beautiful sturdy weathered wood fence. Perfect for form, not so good for function when it comes to a garden. The ring was used to exercise horses. Meaning anything smaller than a horse could fit through the fence. Matt and I decided to add chainlink to keep the bunnies and other hungry creatures away from our garden. I had collected a few rolls of chainlink from the ends of various people’s driveways, but the ring is so big that I had to buy three more rolls. So this project was definitely the most expensive part of the garden so far coming in at nearly $300. Fortunately, we didn’t have to buy posts or anything else besides staples. 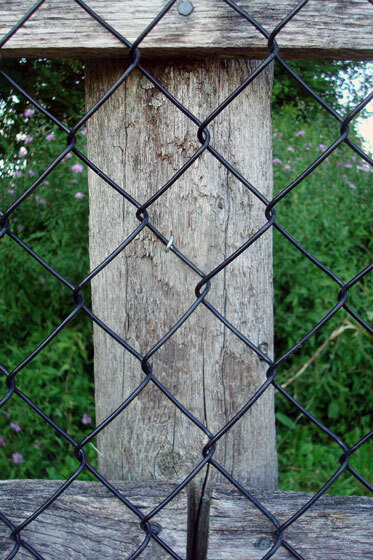 We made use of the wood fence and stapled the chainlink to the existing posts. Lesson learned, we should have thought a bit more about who does what. I stretched the fence, and Matt hammered the staples. I have less muscle than Matt, so stretching the fence was hard for me. Matt has bigger fingers than me, so he hammered his fingers a lot while he was holding the staples between the links of the fence. Matt wasn’t going to give in though. There was no way he was switching roles. So we worked our way around the garden taking breaks to hammer the ground in frustration or slap mosquitoes who just won’t go away this summer. Our marriage survived, and our garden is fenced. Fenced, but not gated. 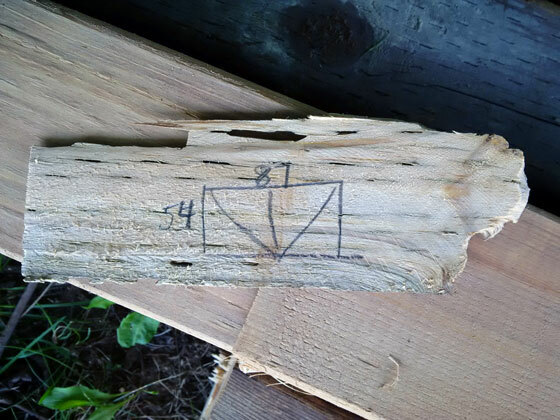 We bought wood for the gate last week but haven’t built it yet. So we are still welcoming the hungry creatures–horse-sized and smaller–to our garden. 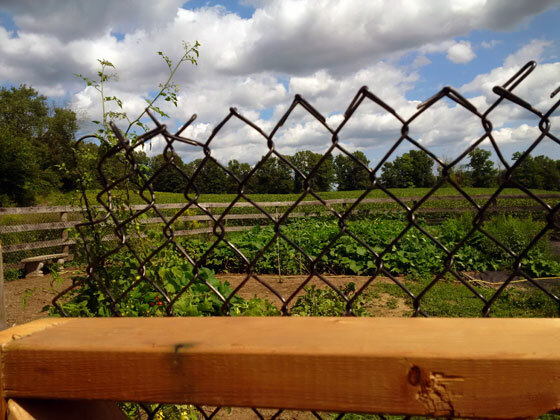 The thing that I like about the fence is that the chainlink is pretty much invisible, so we still have the aesthetic qualities of the wood fence that I fell in love with from the start. And to be honest, our garden isn’t really under threat from the local wildlife. 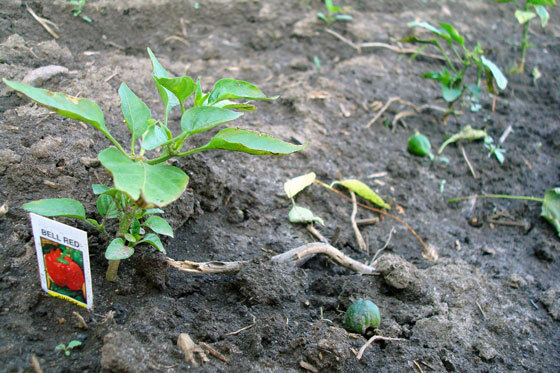 Our beans were munched shortly after they sprouted, but the rest of their gardenmates have survived… and thrived. In fact, I think Matt would be happy if a hungry hoard descended on the zucchini. I know this blog has turned into more of a gardening blog over the last little while as opposed to a home reno blog. We have many more renos to go, but in our limited Canadian growing season, I am going to garden. I appreciate you all sticking with me. In case you can’t tell, we’re loving our new vegetable garden. We’re especially loving all of the food that we’re harvesting. We were a little late on planting (the whole building the garden thing delayed us a bit). So I’ve been trying to be patient when it comes to looking for edible vegetables. However, I’ve perhaps been a little too patient. I thought the zucchinis were still at the blossom stage. A closer look revealed we were past the harvest stage for some zucs. Yipes. There were nine good-sized (really fairly large) zucchinis. And two days later, I harvested seven more (and there’s been one more since then). So far, I’ve made grilled zucchini, chocolate sour cream zucchini cake, zucchini bread, chocolate zucchini bread, zucchini soup and zucchini parmesan. I even snuck a few into my parents’ car when they came to visit the farm. More are coming though. Anyone have any good zucchini recipes? Out of a whole package of bean seeds, only four plants have grown (the others were nibbled right after they sprouted). 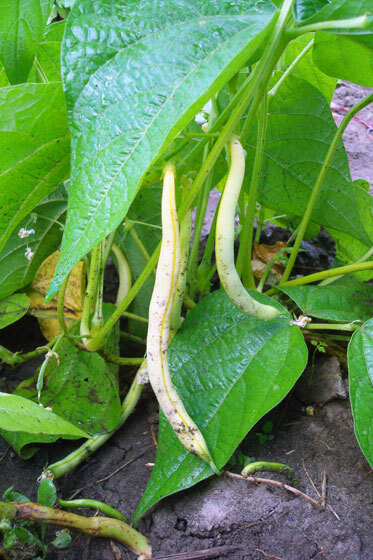 That means our harvest has not been huge, but we’ve had a few lovely yellow beans. 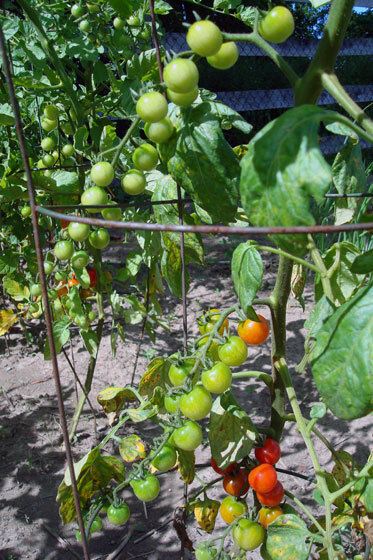 Beside the beans, the tomatoes are turning red. The cherry tomatoes blow me away. I’ve never seen tomatoes grow in clusters like this. And of course, they’re my favourite sweet tomatoes. Very few make it to the house. I eat ’em like candy right in the garden. 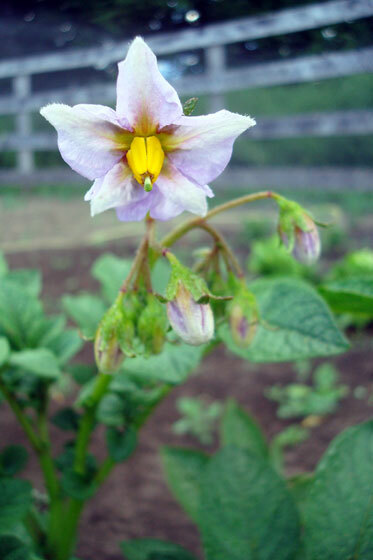 The potatoes plants are blooming. I hope potatoes themselves grow in time for harvest this fall. 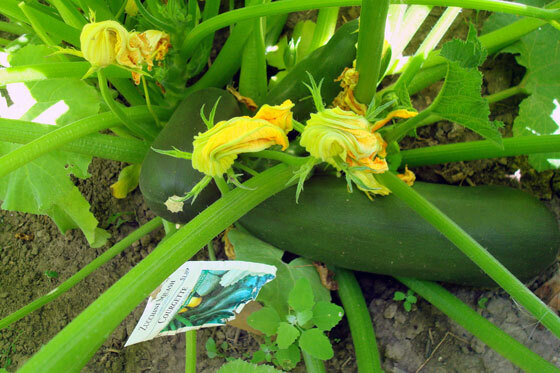 And beside the potatoes, in a mass of leaves and vines, squashes are starting to form. I’m absolutely going to figure out a trellis system next year for the squash. They’re taking over. Good thing we have a big garden, but there are lots of other plants on the wishlist for next year. The squash are going to have to learn to share. 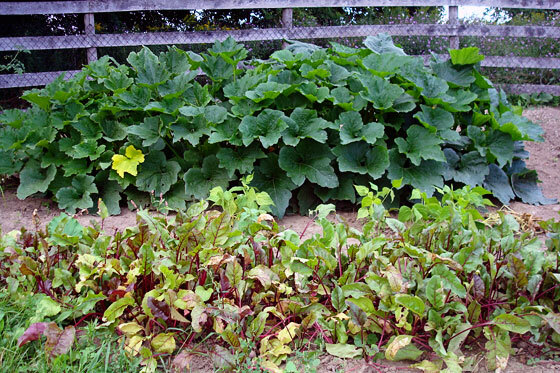 We’re picking lettuce, beets and green onions as we need them, the red raspberries have transplanted successfully, and I have hope that a few of the black raspberries are going to make it. It looks like even the peppers may be perking up. This is the closest I’ve ever been to being a farmer. And I have to say I like it. 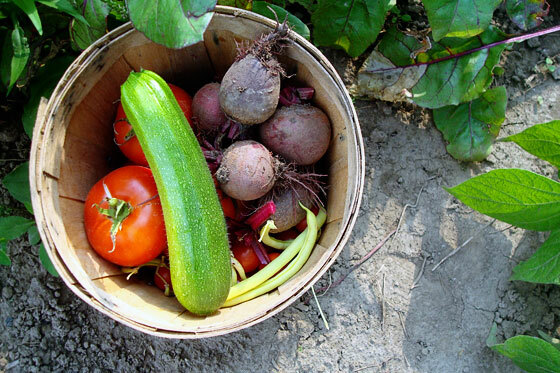 What are you growing, harvesting and eating at your house? 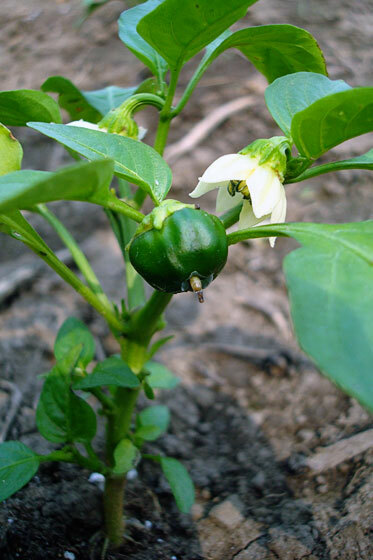 Anyone have tips for growing peppers? Our plants aren’t doing so well over here. Remember this picture of the little pepper and blossoms from a few weeks ago? Well, the plants haven’t grown at all. In fact, they’ve regressed. 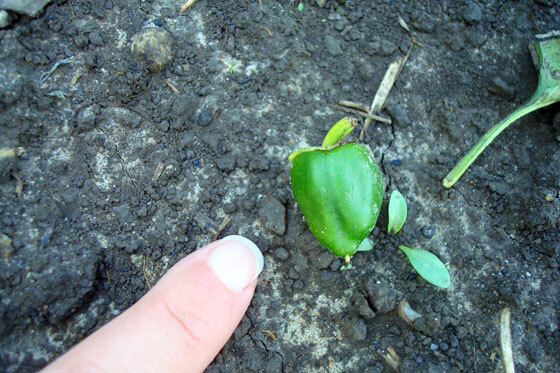 See the little green nuggets laying on the soil? The little peppers fell off their stalks. (My finger is in the shot for scale to show you how little the peppers grew). The peppers are the only things that aren’t doing well in the garden. I thought maybe they weren’t getting enough sun, but we’ve planted two different batches in two different locations. We’ve tried jalapenos as well as sweet red bells. None of them are growing.